K-Pak Leave In Protectant For Damage Prevention is a weightless, foaming leave in treatment which finalises the K-Pak reconstruction process. The final step in your K-Pak hair care regime, K-Pak Leave In Protectant For Damage Prevention will detangle the hair and add a healthy shine whilst protecting it from thermal and environmental damage. Formulated with a Keratin Silicone Complex, K-Pak Leave In Protectant For Damage Prevention repairs current damage to the hair cuticle layers whilst sealing the hair cuticle to prevent further damage. 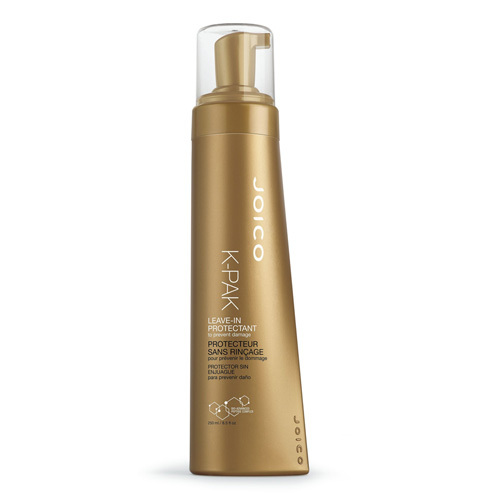 Recently reformulated to include Joico’s revolutionary Bio-Advanced Peptide Complex™, K-Pak Leave In Protectant For Damage Prevention replicates the DNA of healthy hair to repair damaged hair and prevent further hair damage. 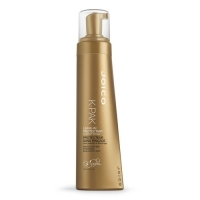 This technologically advanced complex offers a dramatic improvement in the hairs strength, health and natural shine. This luxurious foaming, leave in conditioner detangles the hair whilst protecting it against styling damage, breakage and splitting. Ideal for all hair types, K-Pak Leave In Protectant For Damage Prevention leaves the hair soft and shiny with unwanted static and flyaways effectively eliminated.